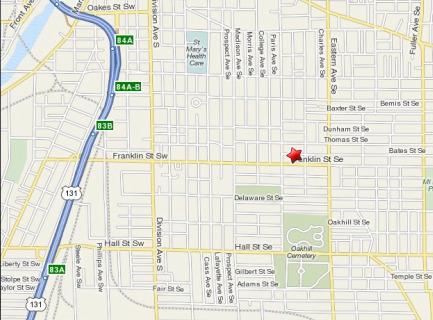 First Church is located at 651Franklin Street SE, Grand Rapids, MI 49507. This is one block west of Eastern & Franklin. The parking lot is accessible off of Franklin Street, at the corner of Henry & Franklin. There is also street parking available. There are many entrances to the church building, including off of the Franklin Street parking lot and toward Henry and Bates streets. The main entrances are off of Franklin Street and toward Henry and Bates streets. You can also enter the smaller street level double doors on the West and East side of the church for direct access to the Children's Ministry rooms. The handicapped accessible entrance is on the Franklin St. side of the church. Ask for directions to the elevator where an attendant is stationed to help both before and after the service. All restrooms on the lower level are handicapped accessible. Large Print Bulletins are availble at the back of the worship center. First Church is equipped with a T-Coil/Loop Assistive Listening System. In addition, hearing assistance devices are available from the sound system booth at the back of church prior to the service.